Some movies, I find, do not translate very well. Gunga Jumna was a massive hit in India - but it left me somewhat cold. Ganga and Jumna are brothers living a hardscrabble village life. Ganga spends his days working with his mother as a servant in the home of the zamindar's obnoxious family, while Jumna, a promising student, focuses on his schoolwork. After their mother passes, Ganga pledges himself to supporting his younger brother as they grow to adulthood. The adult Ganga (Dilip Kumar) is a spirited and hardworking fellow, unafraid to take on the zamindar when necessary, while his brother Jumna (Nasir Khan) is more measured and cautious. Ganga sends Jumna to the city to study, and supports him with funds that he earns driving an oxcart and making deliveries for the zamindar. 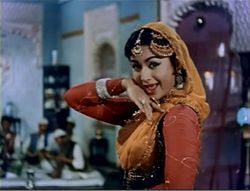 But things get complicated when Ganga saves a local girl, Dhanno (Vyjayanthimala), from the zamindar's lecherous assault. The zamindar (Anwar Hussain) gets his revenge by trumping up a robbery charge against Ganga, landing him in prison. Upon his release, Ganga learns that his brother has become destitute, and attacks and robs the zamindar in a rage. Soon Ganga finds himself an outlaw, and, with Dhanno at his side, he joins a gang of bandits camping out in the wilderness. In the meantime, Jumna meets a fatherly police officer (Nasir Hussain) and becomes a police officer himself. It isn't long before Jumna's professional wanderings take him back to the village of his birth, where he must square off against his outlaw brother, in a showdown between duty and family. With its tale of brothers on opposite sides of the law, Gunga Jumna perhaps resonated with the house divided that was India in the years following independence and partition. There's an allegory in the divergent personalities and approaches to life of the two brothers. The social message is hinted by the brothers' names - they are named for the Ganges and Jamuna rivers, the mythological and geographical axes of India, the junction of which has a rich symbolism in Indian tradition and culture. The suggestion may be that the nation's vitality springs from the juncture of the fiery passion of Ganga and the steady, duty-bound earnestness of Jumna. For me, though, the film's symbolic content was obscured by the fact that it was just a chore to watch. There were times when I was tempted to fast-forward through some excruciatingly slow, yet utterly predictable, sequences. And the characterizations were too indelicate; Ganga is an unthinking idiot - he reacts to offense like a three-year-old, except that he's violent and anti-social - and Jumna is a feelingless android. The result was that I didn't terribly care what happened to either of them, and couldn't get caught up in the allegory either. Gunga Jumna does have its qualities. There is enough substance to the story to make it compelling at times. Dilip Kumar's performance is quite good, despite a lot of shouting - it is not his fault that his character is obnoxious. Vyjayantimala's performance is outstanding - only during her emotional scenes did I feel any stirring within myself. And the music is stellar. A highlight in that department is a mujra by Helen - I've only ever seen her perform this kind of dance once before, and she's great at it.